Quigley says thanks to everyone for all of their amazing support in his fundraiser! Thanks to the generosity of so many, Quigley is receiving the medical care necessary so that he can live a full and happy life. Quigley touched the hearts of many. Pete of Kindred Souls Canine Center LLC had a fundraiser at his Center for Quigley. Pete notes, " He has been symbol of great hope for myself and my school." On his blog, Kindred Souls K-9 Blog, Pete wrote about Quigley. Pete stated, "Now you may ask….why this dog when there are thousands of dogs in need???. My answer is simple. We cannot possibly deal with ALL the needy dogs, but if every so often we choose just ONE, we inspire ourselves and others to go on and help more. And eventually we spread awareness and hope. For me, maybe its because I just lost my Doberman and since I couldn’t save her, saving Quigley is my form of working through the helplessness of loss. But whatever your reason…. helping this little guy stay alive can represent a sense of empowerment over the harsh realities of all dogs in need. And just maybe…..one by one……we can do some good for the Quigleys of the world." 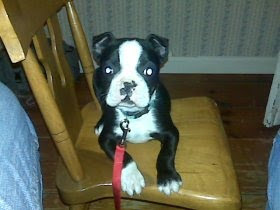 Quigley is a rescued Boston Terrier puppy, approimately six months old, who had surgery due to severe hypospadia. Hypospadia effects his urinary tract and this could not be left untreated. The sutures from the surgery have not grown shut, and Quigley built up scar tissue that ended breaking up and bleeding. He had to have surgery again, and the vet used a laser to remove all the bad tissue. We are thrilled to be able to raise enough to save Quigley, who is a still a baby and a sweet boy with a lot of years to go !! We are cautiously optimistic that he has had his last surgery, but are going to wait another month before officially putting him up for adoption. He can then get his forever home!! Eddie was found as a stray in Edison. When found, he was a bag of bones, the poor thing. He arrived blind in one eye and could only see shadows with the other. His teeth were very bad due to malnutrition and the vet was able to was able to tell his foster mom Judy that Eddie is a senior citizen. Judy takes him to the dog park every day, and says runs walks around like a drunken sailor! (For those of you familiar with drunken sailors!) He tends to wonder aimlessly and has no brakes, probably because he's blind. You have to keep a constant eye on him because he trips and falls over things in his way and if the car window is open all the way he'll jump out. 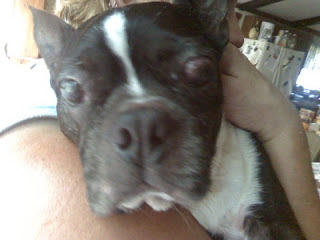 Recently the vet determined that Eddie was in great pain because of the condition of his eyes. The vet recommended that they be removed. He had surgery in August. Judy reports, "Eddie is home. He handled the surgery well and he's actually back to his ole self. It took him a little longer than most to come out of the anesthesia and he had to stay overnight but he's doing well. His pain level is much lower now that the eyes are gone. He woke up this am with no swelling! I'm amazed at well he's healing. He will be much easier to manage without those eyes. He'll be a happier doggie! Thank you all for your prayers! He's still quite a dapper fellow. My husband's new nickname for him is Eddie Wonder!" Judy continues, "Eddie is such a trip and I'm sure at some point in his life he was loved, (just a long time ago), but here he's making up for lost time. He's really attached to my daughter Nicole. He follows her everywhere and they've become great buds. " Sarah, a foster mom at Animal Care & Control, a kill-shelter in Manhattan, started the site Foster Dogs in New York City. NEBTR has linked to this site because of the wonderful work that Sarah does. It is updated daily with dogs from various shelters and rescue organizations in serious need of someone to love them. Her motto is, "Make a difference in a helpless dog's life. Foster a dog today!" 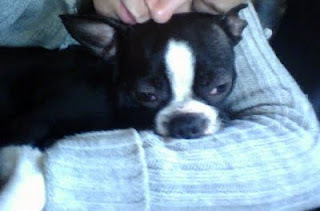 Sarah has featured several of the NEBTR fosters on her site, including Frankie, Ha-Na and Bandit. See their photos and stories below, and go to Sarah's site to see the other equally deserving and gorgeous pups there. Thanks so much Sarah for your help! My name is Frankie. I am 1.5 years old, and have had a very tough start to my life-- but my foster home has been teaching me that life isn’t always bad. I didn’t have any socialization with other dogs, besides my siblings, any humans or the outside world for the first few months of my life. Because of this I really need to be placed in the home of experienced and very patient dog owners. I have come a long way but I still have a ways to go but I am ready to learn. I do like other small dogs but it does take me a little time to warm up and I need a slow introduction. Once I am comfortable with them I love to play like other dogs my age. I can be very uncomfortable when meeting new people and will bark because I am afraid but once I know that they will not hurt me I will relax…then watch out because I am a total cuddle bug who just LOVES to give kisses. Because of my uncertainty of humans I shouldn’t live with children because they can scare me and they don’t understand that I need time to get to know them first. I also shouldn’t be around cats because I will chase them and it will cause fights. I am a smart boy and will tell you when I need to go outside and just go crazy over my chew toys. Bandit is 8 years old and is a very special dog that is looking for an equally special family. Since he's had a hard time feeling confident, his next home should be his forever home. This guy literally smiles whenever he sees you…really, he honestly smiles! He came to rescue because his owner became very sick and could no longer care for him. This boy is ball crazy and likes to play with balls of any size. He likes to push them around by himself and he will let you know if he wants you to play with him when he rolls it to you or bounces it off his head (yes, we did say bounces it off his head). He can play fetch for hours and will often growl when he plays. Bandit can sometimes become very withdrawn needs time alone and his family should understand and respect him enough to allow him that. He will assert himself if you invade is alone space. Bandit can be a very attentive and loving dog but will need someone who will be assertive, consistent and will not spoil him. An experienced dog owner is a must and he will not be placed in home with children and he should be an only dog. His current foster home is currently working on issues he has with collars and his making great progress. 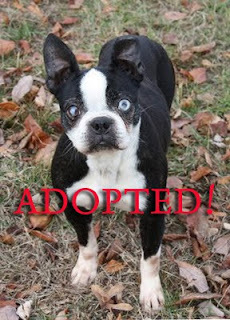 If you have the patience and love to open your heart and home to give Bandit a second chance email Northeast Boston Terrier Rescue and someone will talk with you about Bandit. He may be a work-in-progress, but he still deserves his own forever family! 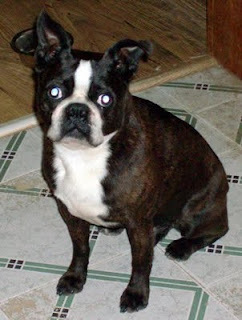 I am Ha-Na and I am an absolutely gorgeous 8 year old Boston Terrier. I am one of the lucky dogs who survived an awful puppy mill. You would have absolutely no idea that my entire life I was abused and neglected by people because I am the sweetest and most gentle soul you will ever meet! I lived in a small cage having litters of puppies and when I was rescued on a snowy December afternoon I still had my mill chain attached to my neck that needed to be cut off with a wire cutter. My foster family quickly found out how bad my life was when they discovered I was blind in one eye from minor injury that could have been easily fixed if I had any veterinary care. have come so far since those days in the mill and now I love to play with the other dogs in my foster home and I am wonderful with children of all ages. My current foster home is noisy and busy but I am not fazed at all- I am just grateful that I finally have a warm, dry blanket to sleep on. One of my favorite things is when someone gives me affection because it is something I never knew before and I am making up for lost time. I am crate trained and don’t mind being in there as long as I have a soft bed. I have learned that I can trust people but I will still cower a bit if you need to pick me up but that is because I am still reacting to my life in that awful puppy mill. It took a few months but I have finally learned to walk up stairs and my foster mom was so proud of me…but I learned going back down but I’m not quite as quick with that. I may be blind in one eye but you would never know because I get around like any other dog and it doesn’t stop me in any way. For an 8 year old dog I am very, very energetic, I guess it is because I am enjoying all my new freedom. I will need patience with housetraining, I do go outside but there are times that I will mark inside the house but I am still learning. Thankfully, Ha-Na has now been adopted and has the first forever home of her own. The Humane Society of the United States has an excellent article on coping with the death of your pet. You can read the entire article here. It recommends five things you can do to help at this difficult time. Hold a memorial service. Let yourself and others who knew and loved your pet say goodbye and share memories during a memorial service. You can hold a service anywhere that feels right to you—at a pet cemetery, in your backyard, in your pet's favorite park, or at any place that reminds you of special times shared with your pet. Find a special place for your pet's ashes. Keep your pet's ashes in a beautiful urn or bury them in a meaningful place on your property. Jill, of Pacifica, California, and her family hiked two miles through the snow to put the ashes of their dog, Mighty, to rest in his favorite spot on their mountain property. Create a living memorial. Let your pet's spirit live again on earth by planting a tree, bush, or flower bed in your yard. Or attach a small plaque to a flowerpot or vase in your home. Sandy, of Lapeer, Michigan, planted daisies around her mailbox to honor her deceased beagle, Daisy, who had always gone with Sandy to fetch the mail. Make a scrapbook. Honor and remember your pet by creating a scrapbook or photo collage. Andrea, of Long Beach, California, has a memorial card her eighty-one-year-old father made in memory of her cockatiel, Pumpkin. The card, which includes loving words from the family and several photos, is displayed on Andrea's coffee table alongside a photo of Pumpkin and a redwood box containing Pumpkin's ashes. Write down your feelings. Put your emotions in writing by composing a poem or story about your pet's life and what made her so special. You might even consider writing a letter to your departed pet, telling him how much you love and miss him. Christine, of Sunnyvale, California, wrote a first-person account from her cat Maya's perspective as Maya left this world to join other animals in a better place. You can send your pet's story to Kindred Spirits, or you can post it on a Web site.